A quick Google search for something like “dentist Eagan MN” will result in dozens of links, ads, and more. We’re lucky that our community has so many people committed to your oral health! But Eagan also has its fair share of corporate-owned dental offices. While these corporate dentists likely share the same passion for dentistry and healthcare that our dentists do, they likely do not offer the same level of care or the same kinds of services an independent dentist can. At first, the differences between corporate and independent dentists may not be evident, but your first trip to a corporate dental office will make them apparent quickly. So here are four reasons you should avoid a corporate dental office in Eagan. Dental clinics that are part of a chain have to hit certain financial goals in order to retain their affiliation with the brand. What this means is that pricing is determined by an off-site office and not by the actual dental staff. This price-fixing, along with a need to hit sales goals, means that some corporate dentists may encourage you to undergo expensive procedures that you don’t necessarily meet your oral healthcare needs. No one likes feeling like a number, but with the sales-driven focus of some corporate offices, it’s likely that you’ll feel like a line item rather than a patient. Your appointment at a corporate office will be brief and sterile. You might not feel any connection to your dentist, and you might not feel like your needs are being understood or addressed. 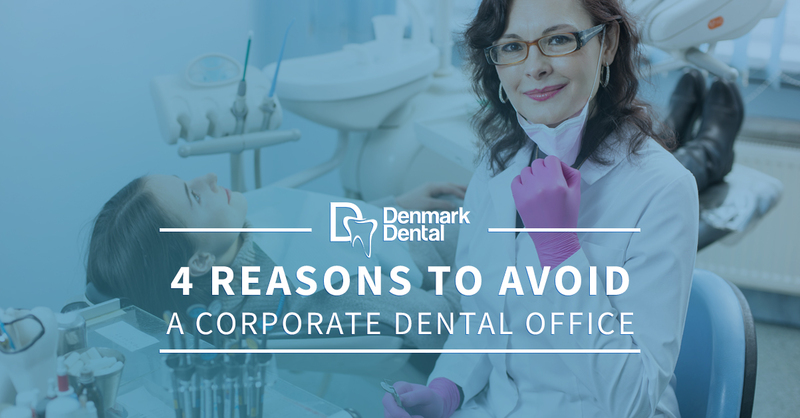 It’s not uncommon for some individuals to avoid going back to a corporate dental office regularly because they don’t feel comfortable there. The quality over quantity model of a corporate dental office means that you may not consistently see the same dentist. This means that issues you were treated for last time might not be followed up on, or that new issues might be ignored entirely. When you’re traded around between dentists, it’s hard to get a consistent quality of care, resulting in your oral health suffering. It’s not uncommon for corporate dental offices to only offer a few basic services and care options. Teeth cleaning, basic fillings, and maybe crowns might be on their list of skills, but not much more. With such limited service offerings, you’ll have to schedule an appointment with a dental specialist. This ultimately costs you more money than if you were to just go to one dentist for your routine and special dental care needs. Here at Denmark Dental, we believe that every one of our patients deserves a high level of care and attention. It’s one of the reasons we’ve remained an independent dentistry during the 40 years we’ve served Eagan. With a wide range of dental services and skills, we can care for all of your dental needs. Book your appointment with us today!